The hush-hush X-37B robotic space plane launched by theUnited States Air Force late Thursday is many things, but it's no space weapon,according to high-ranking official with the project. Gary Payton, Air Force deputy undersecretary of spaceprograms, scoffed at speculation that the X-37B space plane is the vanguard fora spaceweapon fleet and said its main purpose is to test spacetechnology, not orbital weapons. "I don't know how this could be called aweaponization of space," Payton told reporters this week before thelaunch. "Fundamentally, it's just an updated version of the space shuttlekinds of activities in space." Payton's comments were aimed at questions from reporterson how the secretive nature of this X-37B may appear to other countries withand without assets in space. Space policy analyst Joan Johnson-Freese,professor of National Security Studies at the Naval War College in Newport, RI,has told SPACE.com that the X-37B could either be a major advancement in humanspaceflight or be the unmanned end result of the Air Force's dream of building acrewed space plane. "In any case, it is likely that other countries willsee it as another capability intended to assure the United States will be ableto dominate access to and the use of space," she said in an earlierinterview. Payton said that the X-37Blaunch is primarily aimed at testing fundamental technologiesfor reusable spacecraft and space applications. ?If thesetechnologies on the vehicle prove to be as good as we estimate, it will makeour access to space more responsive, perhaps cheaper, and push us in the vectortoward being able to react to warfighter needs more quickly,? Payton said. But it is the spacecraft's appearance as a rapid-responsevehicle that can be launched on unmanned rockets has led to some speculation ofits potential as a space weapon. "Regardless of its original intent, the most obviousand formidable [potential use] is in service as a space fighter - a remotely piloted craftcapable of disabling multiple satellites in orbit on a single mission andstaying on orbit for months to engage newly orbited platforms,"comparative military studies professor Everett Dolman, if the School ofAdvanced Air and Space Studies at the Maxwell-Gunter Air Force Base inMontgomery, Ala., has told SPACE.com. That capability "would be atremendous tactical advantage." Dolmansaid it's still too early to determine what the ultimate use for the X-37B, orany future successors, may be. The X-37B Orbital Test Vehicle 1 was built by Boeing in Seal Beach, Calif., andweighs about 11,000 pounds (about 5,000 kg). This SPACE.com X-37B graphic illustrates somedetails of the space plane and its relative size. Air Force officials have said the X-37B will be tested asa "flexible spacetest platform to conduct various experiments and allow satellite sensors,subsystems, components and associated technology to be efficiently transportedto and from the space environment." The spaceplane's payload bay can fit a couple of small satellites to be launched anddeployed, but it does not have a robotic arm to grapple objects in space andretrieve them. That means it could be used to support military operationsoversees by rapidly deploying space-based assets like small communications orreconnaissance satellites. ?This launch helps ensure that our warfighters will beprovided the capabilities they need in the future,? said Air Force Col. Andr?Lovett, 45th Space Wing vice commander, Launch Decision Authority for themission, after the launch. The X-37B Orbital Test Vehicle also has a long loitertime in space. It has a solar array tucked in its payload bay that can keep itpowered up for around 270 days, Air Force officials have said. 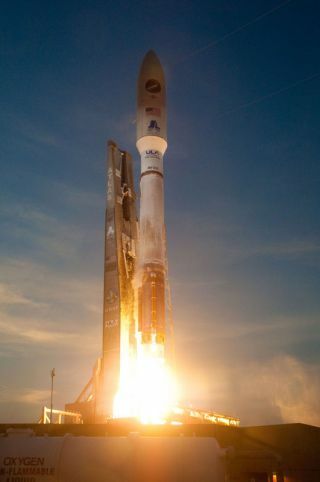 "We, the Air Force, have suite of military missionsin space and this new vehicle could potentially help us do those missionsbetter," Payton said. Payton has said he envisions the X-37B has functioningmuch like the SR-71 Blackbird spy aircraft, being on alert in times of need tofly a mission that could support military operations.? The time betweenflights, during a rush period of many space launches, could be as little as 10to 15 days, Payton said. It is stillunknown how long the first X-37B will remain in orbit. But whenit returns, it is expected to autonomously fly itself through the Earth'satmosphere and land at Vandenberg Air Force Base in California, with EdwardsAir Force Base as a backup. SPACE.com Space Insider Columnist LeonardDavid contributed to this report from Boulder, Colo.